The kids had gone away for the weekend, so the Husband and I decided to do some shopping...AFTER 7pm! (Those of you with small kids know that NEVER happens.) We stopped by Whole Foods Market to look for stevia leaf. That stuff is hard to find, and we've been out for a long while. (They don't have it, by the way.) 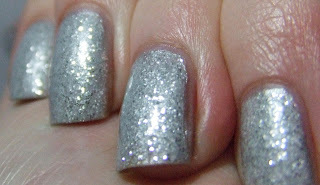 They did have the perfect silver glitter nail polish though, so it wasn't a total loss. Not the best price for it at $8.99, but I've been looking for a good dense silver glitter for a while. Essie makes a nice one, Set in Stones, but I wanted a uniform size. I layered this over a silver so that I wouldn't have to do eleventy-nine coats. But I really didn't need to. This stuff is pretty opaque at two coats.